very interesting lines, he has head line which slopes deep into mount of moon and also there is an intuition line which reaches uptil mars from lower moon. The lower one starts from mount of moon and reaches mars is a typical intuition line which is written in books. But from my knowledge and what i seen they do have some kind of thingh which they can fortell somethingh dangers happen and they get feeling about whether thinghs can happen. I feel looking at head line and intuition his moon should be dominant factor or in other sense his subconcious. One more question, it is very interesting you are able to collect different prints and put it to make discussion effective, great work. He is a nice and wise person. Very enjoyable to talk with. He is a feminine-type (see Fincham) in the sense that he loves talking a lot and is curious about everything (compare with more action oriented male-types). Now in a right hand if the line is in righ hander the subconsious would be activated more in his active part of life but yet there would be somethingh which would be subconcsiusly working when he is doing a lot of thinking ect... in case it is in left hand for person it would be more dream based is what i can think. Thank you Anand. Yes, this is what is the kind of info, I was looking for. But, looking from what Boaz is describing about this person, she is using this more in her public life. That's where I am not able to grasp how to decipher this line w.r.t. to its usage in public and private life. it is very interesting you are able to collect different prints and put it to make discussion effective, great work. Boaz, I aagree with Anand on this. And also, am surprised at the diff.collections you're posting here. Is the person right handed or left handed would be another question. depending upon that the reading would vary. but still there will always be imbalance in lines, but lot of times the reading has to be combined. i dont think there is anythingh called as public and personal in reading it is more about active and passive side. but sides together make the person. if you find from hand the active side on both hands are more dominant than you would be better off combining thinghs based on the dominant type with the passive side playing a role in enhancing or supressing the dominant type. So a combination is what is needed. there was a discussion in this forum left hand and right hand debate you can have a look about what is it all about. anand_palm wrote: if you find from hand the active side on both hands are more dominant than you would be better off combining thinghs based on the dominant type with the passive side playing a role in enhancing or supressing the dominant type. So a combination is what is needed. Anand, nice input. Thank you. anand_palm wrote: i dont think there is anythingh called as public and personal in reading it is more about active and passive side. There infact is a reflection of public/personal life w.r.t. active and passive hands. 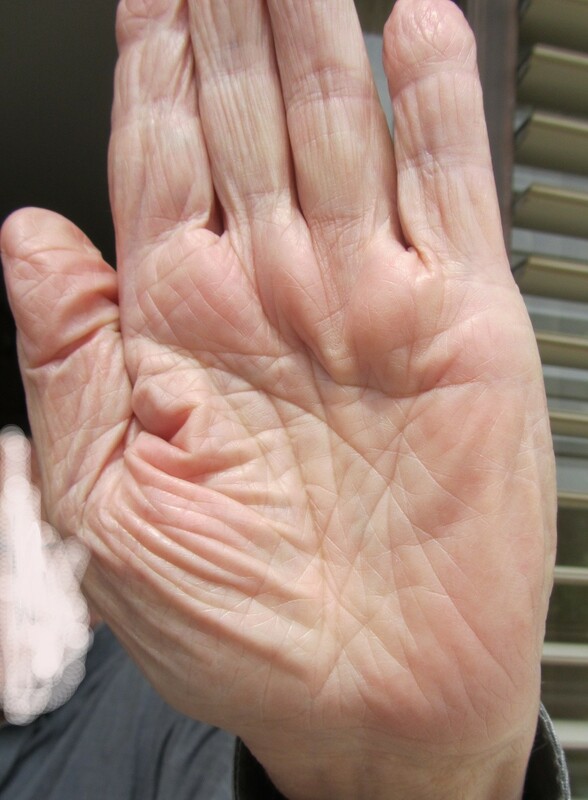 The patterns of the passive hand describe more of our inner life and our private selves and they describe something of the qualities which are more latent within us rather than expressed. If these qualities are expressed at all, this will be more in our family and domestic life rather than in our professional and public life. Hence the patterns of our passive hands describe something more of our personal life and our inner feelings, what is going on within us at this moment in time. It also reveals our more instinctive habits and inclinations rather than our more considered responses. Healthwise, it reveals indications of latent or inherited conditions of ill-health rather than presently manifest illnesses. Is this spirit line inherited to her? Did her mother/father also had this ability? This question is an effort to understand the significance of the presence of this spirit line in her left hand. Thank you Anand and Kiran, I enjoy too learning from these discussions so we all benefit. Please read the discussion there is lot of interesting thingh to ponder, it is not an easy subject to be concluded. when i read charlotte wolfe book she had a different answer, she did not conclude in a sense what is written in christopher jones has mentioned. Still there has to be more concrete work to base it on facts. This is my tip kiran never seperate the hands as public and private it is like mentioning that right and left brain have to be seperated. My suggestion combine both, we are sometimes dominant and sometimes not. Also the concept of what really do people mean by dominant and non dominant needs to be understood, we apply both sides of brain, sometimes on of them more and other may be less, in relaity both togther is what we apply. so when you look from that sense what is public and personal becomes trivial. Her main creases have fine markings on them, little triangles and feathery tiny short branches. Like she's sprouted antenaes everywhere. She must use this energy for her psychic work, but for many others we'd feel stressed or drained. When I first saw the prints few days back the first thing that struck was a triangle sort of formation on the mount of sun on both the hands.Related to the image of the one with heightened senses I had already posted. Seemingly the same triangle appears.Images posted below. Just my plain observations.Not interpreting anything here as the triangle on the sun mount have different interpretations.Cropped the images below.Antennas Seemingly so I think.More so a diamond formation with tentacles on all four sides.Strange formation to see. For the images posted from the earlier post please see the ridge patters under ring finger on right hand. And the triradi from the same location on the left hand.Heightened senses ...Can we say so? I think there is a loop under the head line. I wanted to ask about this but I could not get logged into the forum for quite some time and had thought I never would again, but Martijin got me back in. Thank you Anand. Very useful link. zaobhand wrote: He is a feminine-type (see Fincham) in the sense that he loves talking a lot and is curious about everything (compare with more action oriented male-types). Are you referring to his heart line which is bending to touch the headline as an indication of his feminine-type nature!? Hi Kiran, Fincham says the line of intuition appears on feminine-type people. He is rather soft, talkative, not the male-archetype. I will try to catch few words with him and ask him about his experiences. Does intuition line start from mount of moon or from mount of mercury, how different is it from line of hepatitica or health line. It starts from mount of moon, runs in parallel for some section to hepatica. Its curved in shape(both at the top and bottom portions - like a crescent moon), compared to the hepatica line, which is straight in flow. You can see in the pics posted by Boaz. Hope, this clears your doubts. I guess it is seen on both male and female, i think it is also inherited, if parents have it there is a lot of chance that offspring may have. People with this line usually can get dreams prior to some major events happening. This i think could be due to moon which has strong link to subconciosu and imagination. I have seen some people who have this line and they tend to have some kind of prior intuition about some persons who can be evil or good and also able to say some major events which is going to happen. Thanks Anand for sharing your experiences about this line. Without that large thumb, her subconscious would dominate. I missed this post earlier. The word tentacles is a good choice. Maybe intuitive/psychic feelers. zaobhand wrote: Would you consider this as in intuition line? He is 87 years old. I asked him about this. He said he had such capabilities since he was a boy. He promised to tell me more about it in private. An interesting thing here with the curving line of intuition is how it also connects with a line of Mercury that goes down and runs parallel to the life line. Not touching the life line and running to the wrist is rare and supposed to represent good health throughout life! This forking of the line would add a mix of trusting gut feeling with mental intuition. If the line of intuition was straight and not curved but in the same location it would be a line of a journalist. I think some of these communication qualities are still there. Especially because of how this line mixes with curving short lines under the little finger that move up into the finger itself. I think he has an excellent gift of gab and many stories to share (as you mentioned in your post). He starts talking and it just flows. He may not even know where he's going with the story as his gut and intuition is picking up on his listener's energy and going with the flow. The markings (not the minor dupytrens) under the ring finger show a pleasure in giving of himself and his 'gifts', a natural with an audience. He gets as much pleasure (or more) out of having a good conversation as the person he's chatting with. He enjoys himself. I believe he is healthy but will have to inquire more. He starts talking and it just flows. He may not even know where he's going with the story as his gut and intuition is picking up on his listener's energy and going with the flow. The markings (not the minor dupytrens) under the ring finger show a pleasure in giving of himself and his 'gifts', a natural with an audience. The most obvious is the deep V, it's more noticible because of the dupytrens, but it's present in people's hands without it. A pleasure of giving without expectation of receiving in return. The pleasure is in the doing not in what other's give back.